More Alike Than Different – Hi Blog! I'm Dad. My kids really are a lot alike. I know that their differences may appear more obvious at first, but trust me. It’s their similarities that are more abundant. In both cases, no one answers. And, yes, in both cases I leave. These mirrored moments aren’t new. When she was a baby, Olivia would routinely sleep with her arms bent, cradling her head. She looked like a cartoon drawing of a kid sleeping. We weren’t sure why, but she just seemed comfortable that way. Sometimes she sat in her high chair that way too and looked like she was Queen Sheba of the Baby Foods. It always made me laugh. Years later, Lucas would come along and do the same thing. It’s how he falls asleep and how he will sometimes lay back to watch TV. I’m positive they didn’t plan it. It must be something hardwired in their DNA. It doesn’t end with physical mannerisms. Even routines like getting them each up to bed can make me feel like I’m watching a rerun. In my daughter’s case, when we call, she’ll fall to the couch and pretend to have suddenly fallen asleep. To her, for some strange reason, the thought of fake sleeping on the downstairs couch while wearing school clothes beat having real pajama-wearing sleep in her comfy bed. Weird, but whatever. I try to “wake” her until she eventually laughs. Then we both share a grumpy walk up the steps. In my son’s case, it’s the same – beat for beat. He hears the call, drops to the couch, and goes boneless. I poke him to get up until I finally eek out a laugh. It ends when we both loudly stomp up to his room. Deja vu. If anyone has the time to hear them, I have so much more to list. They both check on dinner repeatedly while it’s cooking. They both constantly need refills of whatever they are drinking. They both cracked my iPad screen. They both love swimming pools. They both lose socks on a regular basis. They both love to eat Pirate Booty and apple sauce. They both pile living room pillows up and dive on them. Just today, I had to tell both of them to stop jumping on the couch on two separate occasions. They both make an insane mess when eating pizza. I could go on like this for a while, starting sentences with “they both”, but I’m pretty sure you get the idea. The point here is that there are tons of examples I can give about how my kids are alike before ever getting to a difference. I could literally go on for pages and pages before ever even saying the word “Autism”. Yet, that’s always where the spotlight seems to rest. My son doesn’t speak and my daughter does – that’s a pretty big thing to notice right off the bat. To those outside our home, Lucas’s Autism is a major deal. To be honest, sometimes it can be a big deal to us inside our home too. Then again, each person in our family has an aspect to his or her personality that is sometimes a big deal in our home. That’s how a family works. The fact that Lucas is non-verbal might cause others to see it as an insurmountable barrier, though, and one that takes away any chance of us all having anything real in common. The ways that Lucas echoes the traits of his sister are only the start. I can make the same list with him and me or him and his mom. 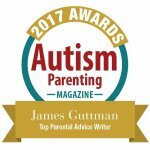 Autism, the one main thing that we don’t have in common, is buried beneath the avalanche of similarities when you think about it. At the end of the day, it’s not about speech, spectrums, or understanding. It’s about who we are as people. I wish we could all use this approach when dealing with the world as a whole. We can all look at what we have in common with each other first rather than the few things that keep us apart. So many of us share the same dreams and hopes. Yet we never notice how we’re similar because we let the reasons we’re dissimilar keep us apart. We don’t need Lucas to use his words to tell us all the ways he’s like us. We can see those similarities for ourselves. Sure, it would be easy to miss them if we were busy wringing our hands and crying over the few things that make us different. So, I, my wife, and daughter, don’t do that. Come to think of it, Lucas doesn’t either. I guess that’s just another thing we all have in common.